I have been looking forward to the Food Truck Fest all summer long! I wasn’t sure what to expect, I just knew I wanted to try something different, strange even. I had food trucks built up in my head as adventure dinning. I was a little disappointed in that most of the options were things I’ve tried before, and even a bit pedestrian. And, maybe I don’t handle too many choices very well because I had a really hard time determining what the heck I wanted to eat. I walked around and around re-reading menus and totally overthinking my options. I really wish each place was serving single bites of their main dish, especially since you could vote for your fave. It’s hard to vote when you can’t possible eat all of it. 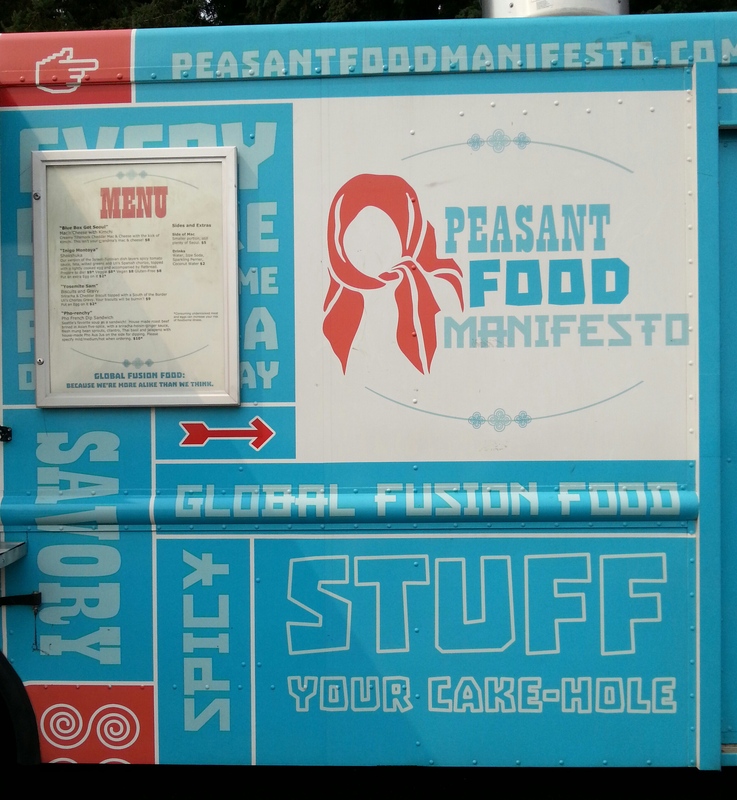 After much debate I went with what I thought was the most out there offering and ordered Pho-renchy from Peasant Food Manifesto. They combine several types of food and flavor in single dishes. Mine was basically Pho soup turned into/mashed into a French Dip sandwich. It was interesting. A bit confusing to my taste buds as it was such a mix of vastly different flavors. It wasn’t bad, but not spectacular, but I ate most of it. A very confusing review I know. I really wanted to try the mac n cheese with kimchi, but didn’t want a whole order of it, even just the small order of it. A sample size would have been great…I mean I would have paid $1 or $2 at several of the trucks just for a taste of their food. 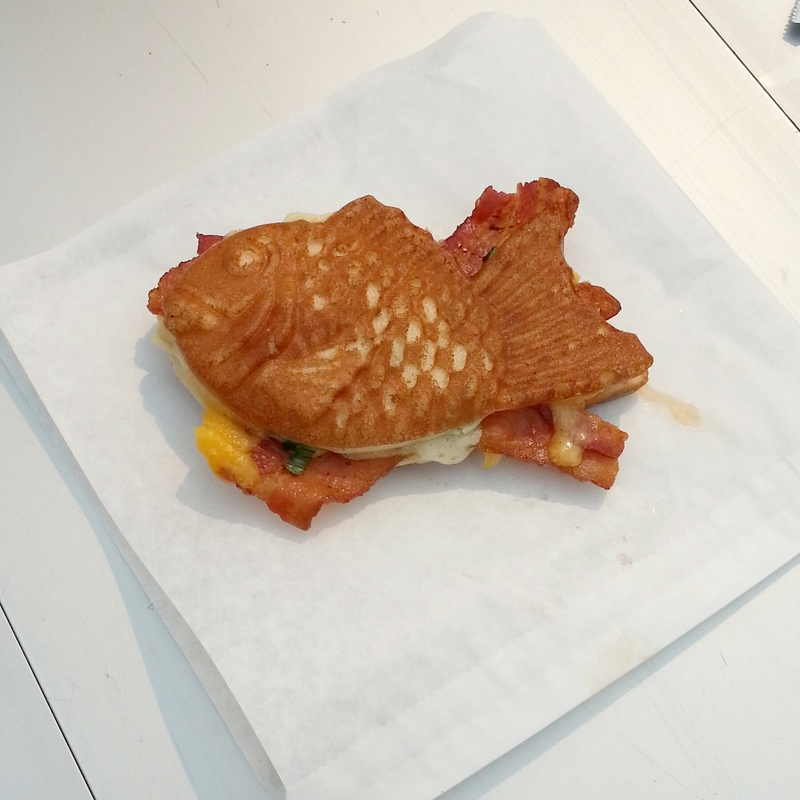 We also tried these fish shaped waffle things that were stuffed with different things. Some savory with bacon, onion and cheese, and others stuffed with apples or custard. We tried the bacon one and it was good, not over the top special, but good. The custard filled waffle fish was so yummy. The perfect sweet treat after the savory food we tried. The biggest disappointment was the lack of options for those with food allergies. GF and dairy free options were hard to find. There was a vegan options that was both, but it wasn’t all that appetizing to Mark. So, you know if I ever do a Food Truck of my own (which honestly is a brilliant idea and I’m doing some homework as you read this) it will be dairy free, gluten free, and most likely Paleo’ish. I have a few recipes in mind aready. 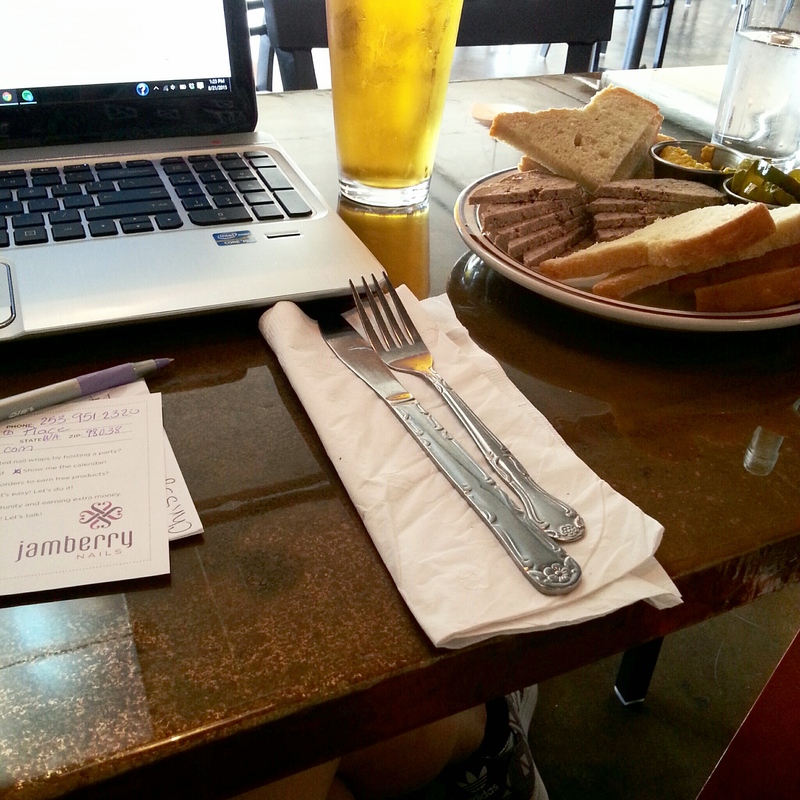 My other food adventure over the weekend was at the Point Defiance Tap and Grill. Sky was at zoo camp for a few hours and I decided get some work done in a temporary office, and try some new brew and food. I went with a blond beer (I forget the brewery) that was good and the lamb & beef pate’. Maybe I’m not a pate’ fan, I haven’t had it enough to know really. It was ok, I was able to eat it, but it had very little flavor. Thankfully it’s served with a flavorful, slightly spicy mustard and that gave me some flavor. Overall I liked the atmosphere, I was able to sit there for almost 3 hours, spread out all over my table getting a ton of work done, and my server, Nicole, was awesome! I’d totally go back to try some of the other interesting sounding menu items and brews. What’s the most adventurist thing you’ve eaten? 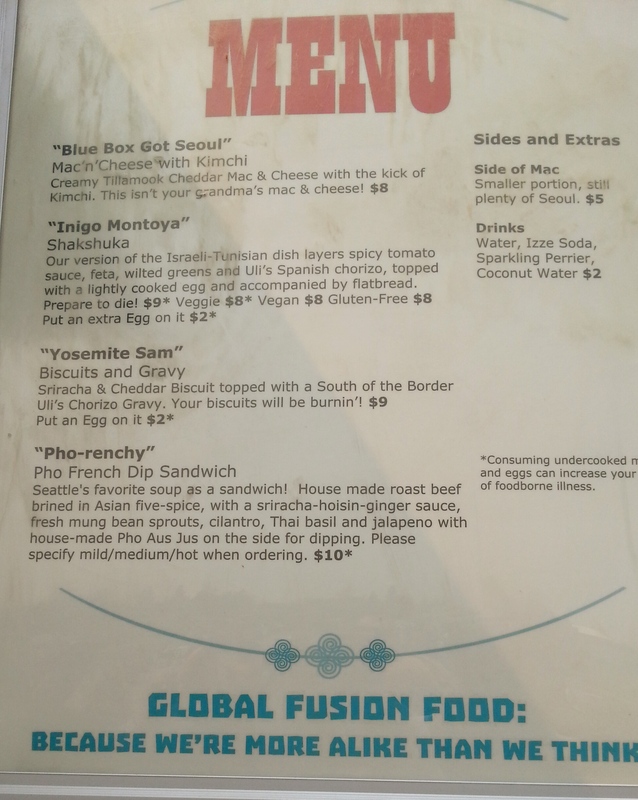 They had some interesting stuff on the menu, I think I would have gone for the Inigo Montoya.